Nourish, a gluten free restaurant in Scottsdale, AZ, has so many gluten free choices that I don't feel like I have to settle. Their menu makes very clear what common allergens may be in each dish. Almost everything I have tried has been great, but a few of the items have been overwhelmingly disappointing. Amazing quiches with a quinoa crust, sweet potato fries that are air fried (but you would never suspect it) and great pizzas and burgers. And to top it all off a fabulous ambiance, full bar, and an absolutely delightful patio. Please let us know if you've been to Nourish Restaurant and how you liked it. – Click here to read or post comments. Thanks for letting us know about Nourish–I think this could be the amazing place we went to in Scottsdale, if my memory serves me. But we were travel weary, and I wouldn't have remembered the name of it. I look forward to trying it (again?) when I’m in the area. Hope you’re finding the site useful! Nourish has an extensive gluten free menu. From the menu posted online it appears that all their food is gluten free. They even have gluten free beer! 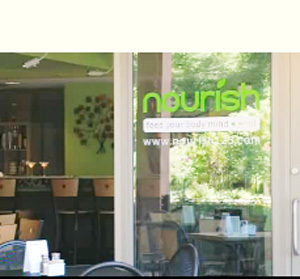 Nourish is on Highland Ave west of Scottsdale Road. Below are the directions from their website. "You can find Nourish on the south side of Optima Camelview Village on Highland Ave. off of Scottsdale Road, two blocks north of Camelback Road. We’re north of Old Town Scottsdale and Scottsdale Fashion Square." Nourish's website describes themselves as a casual style restaurant serving delicious comfort food with a healthy twist. If you're not convinced to try Nourish, check out the rave reviews on their website. They also offer packaged meals to go, including beer and wine. 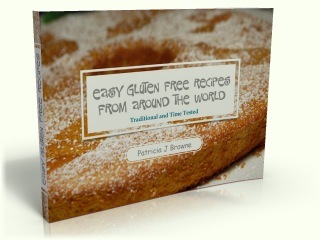 Want some easy gluten free recipes? Download this ebook for free when you sign up for my FREE monthly ezine. Join in and write your own page! It's easy to do. How? Simply click here to return to Gluten Free Restaurant Reviews.